For Saitek Pro Flight Instrument Panel. This is folder contains 8 essential gauges, 7 for the Beech Baron and 1 for the Mooney Bravo. Beach Baron: Airspeed with TAT, Alternative Airspeed with the True air speed, Vertical Situation Indicator (VSI), Altimeter, Radio Magnetic Indicator (RMI), Horizontal Situation Indicator (HIS) and Vertical speed. Mooney Bravo: Airspeed with TAT. This tutorial explains how to use multiple folders to store the FIP files instead of using the standard Gauges folder. This provides an easy way to manage all your FIP files without the risk to delete a wrong file or to modify a file that is valid for more than one FIP. Just push "SHIFT+F4" to set the pitch trim in neutral position. FSX and FS 2004 stand alone XML gauge. By Pierre Fasseaux. Upgrade with "Fliyng Time" automatically starting at take off and stopping at landing. Six functions available (GMT, LT, FT, chrono + OAT, Voltage). Activation through key strokes (Not for 2004). Two background bitmaps available (w/ or w/o screws). FSX and FS 2004 stand alone XML gauge . By Pierre Fasseaux. This gauge will engage the landing lights below 10000feet and disengage above 10000feet. Easy instructions how to add to your panel folder are included. This is an update to my original Saitek FIP Radio Panel Mod. This update adds numerous features found on other Saitek Panels, such as lights, gear, etc. See Readme for entire list of functions. Breitling-, Longines- or Douglas-like, w/ or w/o mounting. The clocks show the local time when starting the situation then the hour hand DOES NOT FOLLOW automatically the timezone crossings ! FSX and FS 2004 stand alone XML gauges. 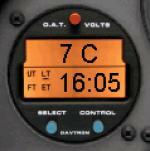 TextInfo Gauge displays flight data in the top left area of the screen as text and digital readouts. The data is displayed on a transparent background so that the information floats in front of the simulation. 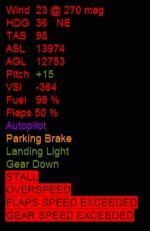 FSX provides a small digital readout when the user presses Shift-Z. 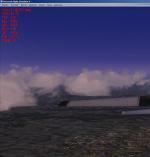 Shift-Z is configured by editing the [Textinfo] sections in the FSX.cfg file. Unlike the [Textinfo] settings, TextInfo Gauge is fully configurable with the full range of FSX variables, fonts and colors. The script uses very simple code lines that are easily edited by nonprogrammers. In fact, the author had no programming experience prior to writing this script. The script does not work for some older aircraft. Easy to install, only requires one XML file and the addition of a few lines to the aircraft's panel.cfg file. No impact to Frames per Second (FPS). It simply displays internal data as text. In its default configuration it provides this data: Wind speed and direction, Magnetic compass heading in degrees and direction (N, E, S, W), True airspeed, Indicated altitude, Radio altitude (altitude above ground level), Pitch (green for ascending, red for descending), Vertical speed, Percent fuel remaining, Flaps % extended (only displayed if aircraft has flaps), Autopilot indicator (only displayed if aircraft is equipped with an autopilot and the autopilot is engaged, Parking brake indicator (only displayed when parking brake is engaged),Landing light indicator (only displayed when light is on), Landing gear indicator (only displayed if aircraft has retractable gear, shows % extended while extending/retracting and indicates when gear is fully down), Flashing warning indicators that are only displayed as needed: stall, overspeed, flap speed exceeded, landing gear speed exceeded.